Biogents’ mosquito traps were invented by scientists who have been doing research on the behaviour of mosquitoes and other blood-sucking insects for over 16 years. The scientific foundation of Biogents mosquito traps are more than 300 publications that document the exceptional capture rates. Useful applications and a number of patents have resulted from sound fundamental research at the University of Regensburg. Capture devices originally built for fellow researchers and specialists have evolved into fully developed products within a short period of time. The BG-Sentinel already became one of the leading traps for monitoring tiger mosquitoes and other species within just a few years after its invention in 2004. A steadily growing number of independent scientific publications reviewed by experts supply impressive evidence of the widespread use of Biogents traps. 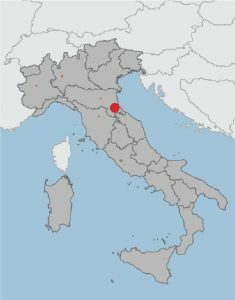 E.g., a study in Cesena, Italy, shows a reduction of mosquito bites up to 85 % in areas with Biogents traps, see below. The growing spread of the invasive mosquito species Aedes aegypti (L.) and Aedes albopictus (Skuse) increases the complexity of mosquito control. In contrast to several other mosquito species that are found in the home environment, such as the house mosquito Culex quinquefasciatus, the container-inhabiting tiger mosquitoes are day-active. Adulticidal operations at daytime are not feasible and reaching all breeding sites in larviciding operations is practically impossible. Many home owners use mosquito traps to reduce mosquito populations in their backyards. Several traps with different attraction mechanisms and price categories are commercially available, but most of these traps were not scientifically proven to be effective. The Biogents BG-Sentinel trap has been used by researchers all over the world for over a decade to monitor dengue vectors and is generally recognized as the gold standard mosquito trap for yellow fever and Asian tiger mosquitoes. The trap uses the BG-Sweetscent, an artificial human skin scent that contains lactic acid. The BG-Sentinel can additionally be operated with CO2 to increase catch rates and species spectrum. The commercially available BG-Mosquitaire trap uses the same mosquito attraction and collecting mechanisms as the BG-Sentinel, but instead of being lightweight and collapsible for scientific or public health purposes, it was designed to be more robust and visually pleasing, for use in fixed positions throughout the whole mosquito season in backyards, restaurants, hotels, and similar locations. 1) Do tiger mosquito catch rates of other commercially available mosquito traps increase when adding the BG-sweetscent lure? Yes – catch rates of tiger mosquitoes in different UV light mosquito traps increased up to 4.2-fold. Fig 1. 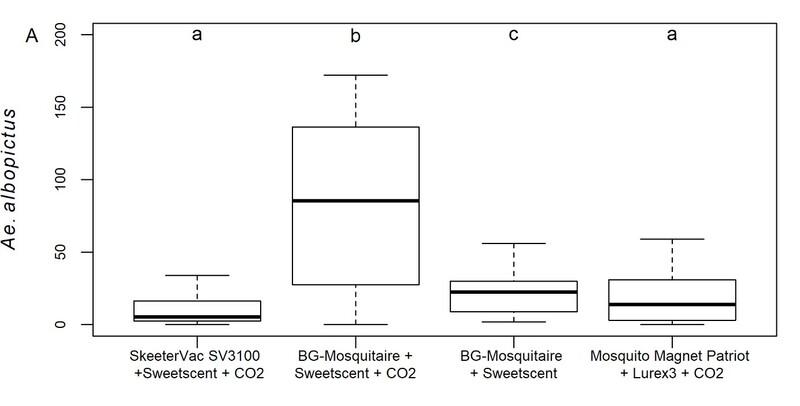 Biogents BG-Sweetscent increases Asian tiger mosquito catch rates in commercially available mosquito traps. 2) Is the commercially available BG-Mosquitaire trap as good as the professional BG-Sentinel trap? Yes, there was no statistical difference between the Ae. aegypti and the Culex quinquefasciatus catch rates of the two traps, neither when tested with (Fig. 2 A), nor without CO2. Fig 2. 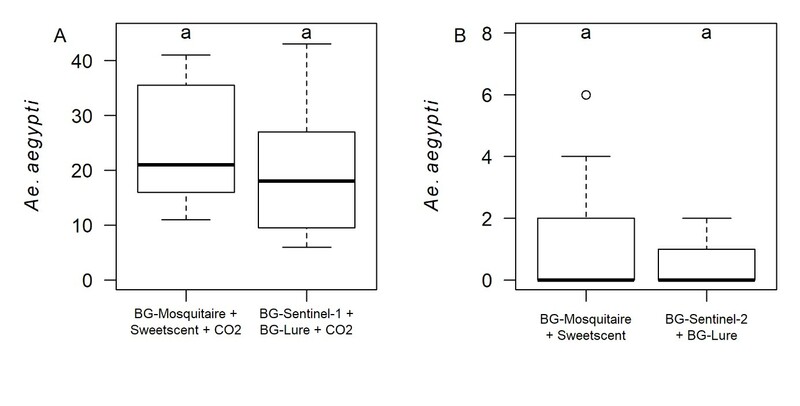 Boxplots of Aedes aegypti (female and male) catches in BG-Mosquitaire and BG-Sentinel traps (A) in Clovis,CA, and (B) New Orleans. The same letters indicate insignificant different catch rates. 3) Is the BG-Mosquitaire trap with and without CO2 better than two other mosquito traps that need to be obligatorily operated with CO2? Fig. 3. Boxplots of (A) Aedes albopictus (female and male) in 4 different mosquito traps in Lake Charles, LA. Please note that 2 outliers (302 and 523 Ae. albopictus in the BG-Mosquitaire+Sweetscent+CO2) are not shown in order to facilitate visual comparison between boxes. Different letters indicate significantly different catch rates. Government-led programs to control dengue have often failed. Urban Aedes mosquitoes such as the yellow fever mosquito Ae. aegypti and the asian tiger mosquito Ae. albopictus mainly breed in small containers on private properties. They therefore seem to be great species to be targeted by control programs that strongly rely on citizen participation. The town of University Park, MD, USA used the BG-GAT traps in a citizen-based mosquito control intervention. The town is highly infested with Ae. albopictus and comprises approximately 1000 residential yards. The approach named Citizen Action through Science (Citizen AcTS) is based on citizen volunteers that are mentored by scientific advisors. Residents were encouraged to purchase two BG-GAT traps (one for the front- and one for the back yard). Each block of houses had a community leader that informed their neighbors about the initiative. Every participant was responsable for the installation and maintenance of the purchased traps. Almost the half of the town’s residential yards (439 of 954) were equipped with GATs. 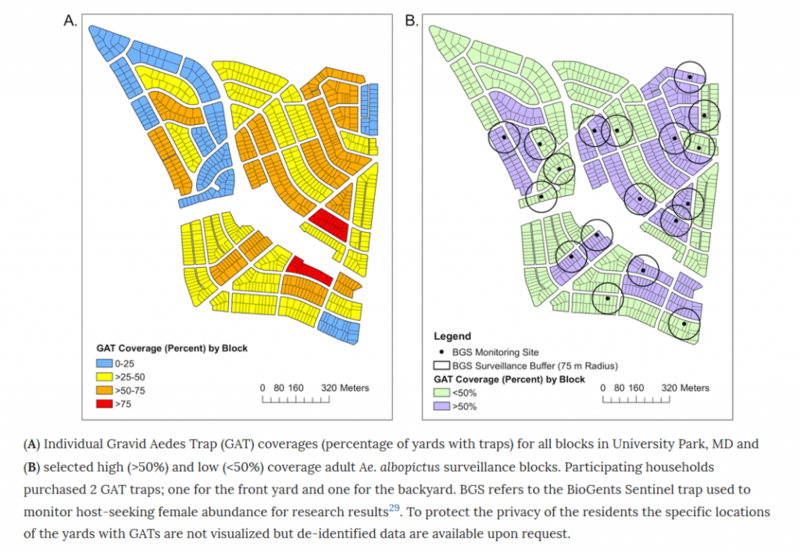 Results indicate effective mosquito control, however the reduction of mosquito nuissance was significantly higher in blocks, where more than 80% of households used GAT traps (Fig. 1). Fig. 1 Mean (±SE) female Ae. 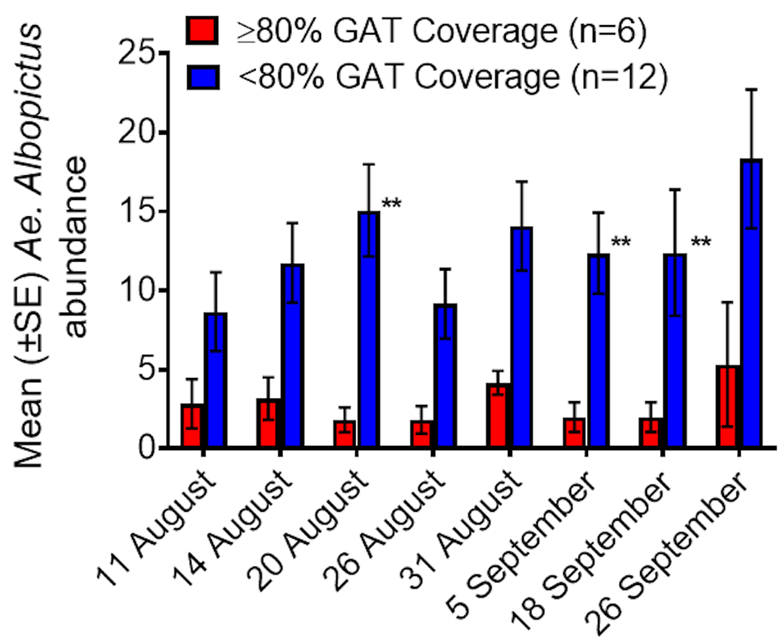 albopictus abundance during each collection point in high (≥80%) and low (<80%) coverage monitoring sites. Different letters or presence of ’**’ indicate statistical significance between observations (P < 0.05). Johnson BJ, Brosch D, Christiansen A, Wells E, Wells M, Bhandoola AF, Milne A, Garrison S, Fonseca DM. 2018. Neighbors help neighbors control urban mosquitoes. Sci Rep. 8(1):15797. doi:10.1038/s41598-018-34161-9. 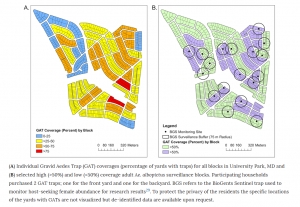 Individual Gravid Aedes Trap (GAT) coverages (percentage of yards with traps) for all blocks in University Park, MD and (B) selected high (>50%) and low (<50%) coverage adult Ae. albopictus surveillance blocks. Three houses with garden were treated with a network Biogents traps that were operated with CO2 and BG-Lure for 3 months during the peak activity season of Ae. albopictus. The average distance between the traps was 5 m. The three treated properties received 9, 13, and 18 traps, depending on their size (Fig. 1a-c). The trap network is called “Bio-Belt Anti-Moustique” and was patented by the French company HBM Distribution SAS. The mosquito biting pressure in outdoor areas of the three treated houses was compared to the biting pressure in three untreated houses with similar environments. An effect of the trap barrier is visible from the time, when traps were turned on (vertical dashed line in Fig. 2). After three weeks of continous trapping, the biting pressure was substantially reduced in the houses that were protected by traps, in comparison to untreated houses, and after six weeks, the biting pressure was reduced to almost zero. Fig. 2: Weekly mean Ae. 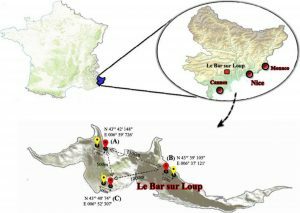 albopictus biting pressure in three houses with BG-Sentinel trap barrier system and in three untreated control houses in southern France, July – Sept 2016. The dashed vertical line indicates when the trap barrier system was turned on. Akhoundi M, Jourdain F, Chandre F, Delaunay P, Roiz D. 2018. Effectiveness of a field trap barrier system for controlling Aedes albopictus: a “removal trapping” strategy. Parasit Vectors. 11(1):101. doi:10.1186/s13071-018-2691-1. Geographical positions of treated (red) and control (yellow) houses in the present study. Since its introduction and establishment in Italy during the early 1990s, the Asian tiger mosquito, Aedes albopictus, has spread over large parts of Italy and other Mediterranean countries. Aedes albopictus is both a nuisance and a competent vector for various arthropod-borne pathogens. Although efficient traps for Ae. albopictus exist and are used for population monitoring, their use as a control tool has not yet been studied. We evaluated Biogents BG-Sentinel mosquito traps, used with the BG-Lure, as control tools in northern Italy. The trial was performed as a controlled experiment in which 3 intervention sites, equipped with 7 or 8 BG-Sentinel traps each, were matched with 3 comparable control sites. Trap density ranged from 1 trap per 150 m2 to 1 per 350 m2. Mosquito populations were monitored at both the intervention and control sites with weekly human landing collections (HLC) and ovitraps. Between 64% and 87% fewer Ae. albopictus individuals were collected by HLC at the intervention sites with the BG-Sentinel mosquito traps, as compared to the untreated control sites. These results indicate that the sustained use and proper placement of efficient mosquito traps can significantly reduce Ae. albopictus biting pressure. Englbrecht C, Gordon S, Venturelli C, Rose A, Geier M. 2015. Evaluation of BG-Sentinel Trap as a Management Tool to Reduce Aedes albopictus Nuisance in an Urban Environment in Italy. J Am Mosq Control Assoc. 31(1):16–25. doi:10.2987/14-6444.1. Regensburg 2014/03/27 – Dengue fever is widely distributed in Brazil and other tropical and subtropical regions and a constant threat to the local population. Dengue is mosquito-borne virus that infects up to 100 million people each year. Because there is no effective vaccine available, the only way to control the disease is by controlling the dengue mosquitoes. While the use of conventional insecticides is widespread, they have become increasingly ineffective due to insecticide resistance. A new approach to control the mosquitoes could be the mosquito trap developed by Biogents. 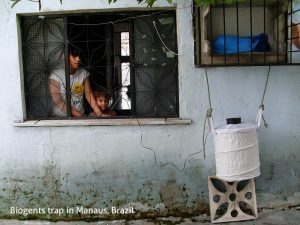 A large-scale study published in the Entomological Society of America’s Journal of Medical Entomology has demonstrated for the first time that these traps can also reduce the number of dengue mosquitoes (Aedes aegypti) in a broad urban area. The study co-financed by the world-bank was conducted over 18 months with more than 1400 households and 450 Biogents traps in Manaus, Brazil. The result: „The study shows that the Biogents traps can significantly reduce the amount of adult female Aedes aegypti especially in the rainy season” says Prof. Eiras from the University Federal de Minas Gerais (Brazil). The number of dengue infections in the test areas also decreased. An additional advantage for household trap users was the Biogents traps also reduced numbers of the annoying and often numerous tropical house mosquito (Culex quinquefasciatus). Households that used the traps reported a noticeable reduction in the nuisance from mosquitoes. Additional studies will be required to investigate the effects of trapping on larger scales and during epidemics. Degener CM, Eiras E, Zara TMF, Roque RA, Rösner S, Codeço CT, Nobre AA, Rocha ESO, Kroon EG, Ohly JJ, et al. 2014. 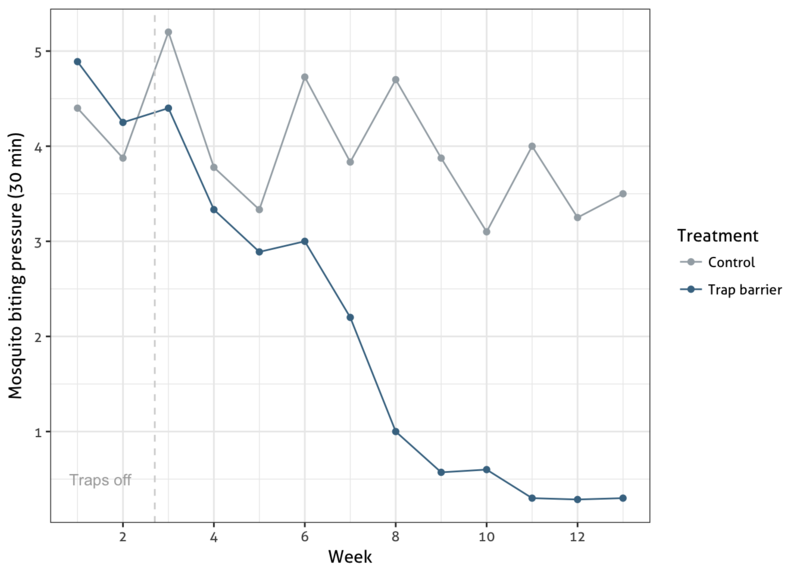 Evaluation of the Effectiveness of Mass Trapping With BG-Sentinel Traps for Dengue Vector Control: A Cluster Randomized Controlled Trial in Manaus, Brazil. J Med Entomol. 51(2):408–420. doi:10.1603/ME13107. 40 to 50 BGS traps were utilized during an intensive 5-year surveillance as part of an ‘Area-wide Management Program for the Asian Tiger Mosquito’ in NJ, USA. The results are now published. The authors say that the Biogents Sentinel (BGS) trap is a very effective tool to monitor adult populations of Aedes albopictus and that although BGS traps are becoming the gold standard instrument for Ae. albopictus surveillance, they can also be used to collect other important mosquito species, which can enhance existing vector surveillance programs. Unlu I, Farajollahi A. 2014. A multiyear surveillance for Aedes albopictus with Biogents Sentinel Trap counts for males and species composition of other mosquito species. J Am Mosq Control Assoc. 30(2):122–125. doi:10.2987/14-6401.1. Lühken R, Pfitzner WP, Börstler J, Garms R, Huber K, Schork N, Steinke S, Kiel E, Becker N, Tannich E, et al. 2014. Field evaluation of four widely used mosquito traps in Central Europe. Parasites and Vectors. 7(1). doi:10.1186/1756-3305-7-268.